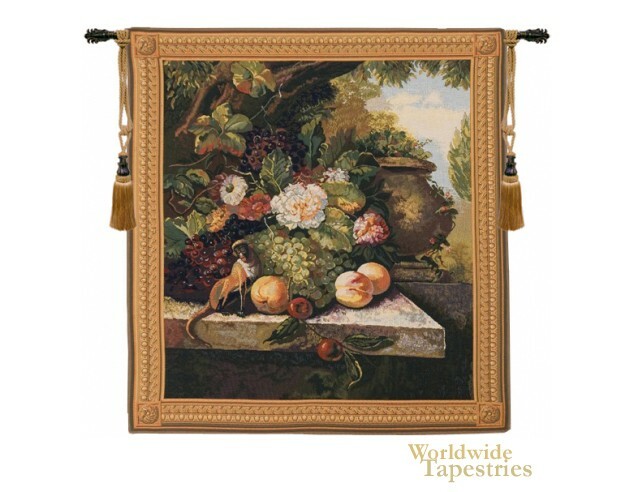 This Belgian floral tapestry Monkey In Still Life I shows an arrangement of flowers on a stone ledge, with fruit and a monkey. Here in this piece we see a work which reflects the master painters style of the 17th century to shows an elaborate collection of flowers in a natural setting outdoors, with peaches, grapes and plums. Monkey In Still Life I tapestry is backed with a lining and a tunnel for easy hanging. Note: tapestry rods and tassels, where pictured, are not included in the price. Dimensions: W 37" x H 39"